Risingbd Desk: Astronomers have discovered a super-size black hole harkening back to almost the dawn of creation. It's the farthest black hole ever found. A team led by the Carnegie Observatories' Eduardo Banados reported in the journal Nature on Wednesday that the black hole lies in a quasar dating to 690 million years of the Big Bang. That means the light from this quasar has been traveling our way for more than 13 billion years. Banados said the quasar provides a unique baby picture of the universe, when it was just 5 percent of its current age. It would be like seeing photos of a 50-year-old man when he was 2 1/2 years old, according to Banados. 'This discovery opens up an exciting new window to understand the early universe,' he said in an email from Pasadena, California. Quasars are incredibly bright objects deep in the cosmos, powered by black holes devouring everything around them. That makes them perfect candidates for unraveling the mysteries of the earliest cosmic times. 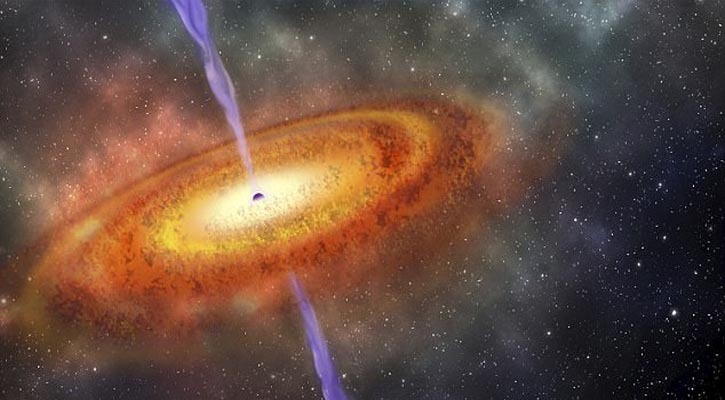 The black hole in this newest, most distant quasar is 800 million times the mass of our sun. Much bigger black holes are out there, but none so far away — at least among those found so far. These larger black holes have had more time to grow in the hearts of galaxies since the Big Bang, compared with the young one just observed. 'The new quasar is itself one of the first galaxies, and yet it already harbors a behemoth black hole as massive as others in the present-day universe,' co-author Xiaohui Fan of the University of Arizona's Steward Observatory said in a statement. Around the time of this newest quasar, the universe was emerging from a so-called Dark Ages. Stars and galaxies were first appearing and their radiation ionizing the surrounding hydrogen gas to illuminate the cosmos. Banados suspects there are more examples like this out there, between 20 and 100. 'The newfound quasar is so luminous and evolved that I would be surprised if this was the first quasar ever formed,' Banados said. Only one other quasar has been found in this ultra-distant category, despite extensive scanning. This newest quasar beats that previous record-holder by about 60 million years. Still on the lookout, astronomers are uncertain how close they'll get to the actual beginning of time, 13.8 billion years ago. Banados and his team used the Carnegie's Magellan telescopes in Chile, supported by observatories in Hawaii, the American Southwest and the French Alps.